The Artel's exhibit will showcase the company's expanding portfolio including solutions for SMPTE ST 2110, AES67, SMPTE ST 2022-7 Seamless Protection Switching, and ARQ Reliable Internet Streaming Transport (RIST) for OTT streaming. The solutions to be showcased will include the SMART Media Delivery Platform, Quarra PTP Ethernet Switches, ARQ IP Streaming System, and their Standards-Based IP Transport With DigiLink and InfinityLink Platforms. A finalist for the 2018 IABM BaM Awards in the Connect category, the SMART Media Delivery Platform is a carrier-grade, software-defined platform with integrated nonblocking Layer 2/3 switching and routing capabilities. Designed to attach seamlessly to the IP network without the need for external network elements, the SMART platform supports SMPTE ST 2022: 1, 2, 5, 6, and 7 hitless switching; QoS; VLAN tagging; and traffic management. The platform features four video ports for transport of video, audio, and ancillary data and four GigE data ports bridged to a 10G interface. The SMART solution is software-enabled, providing an easy and efficient platform for adding or upgrading functionality via software download. The Quarra family of PTP-enabled switches offers the industry's most accurate IEEE 1588-compliant timing and synchronisation. 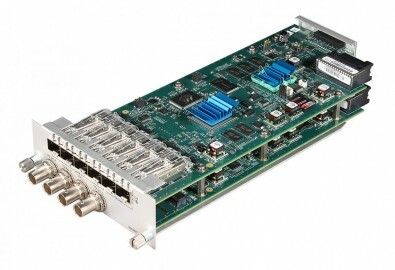 The switches support SMPTE ST 2110 and ST 2059-2, permitting interoperable use of IP-based media equipment with conventional genlocked SDI equipment. They are RAVENNA AES67-approved and Dante- and QSC-tested. Quarra switches are designed for audio/video broadcast, defense and security, finance, utilities, telecom, and enterprise IT applications in which accurate timing and control are required. The ARQ IP Streaming System serves Reliable Internet Streaming Transport (RIST) for OTT video applications. The ARQ system is simple to configure and ideal for distribution of high-quality video over unconditioned IP networks, including wireless, internet, and satellite. The ARQ solution is scalable in single-stream increments, allowing broadcasters to quickly add ARQ licenses to deliver multiple UDP unicast and multicast services. At the 2018 IBC Show, Artel will feature its SMART Media Delivery Platform with its other SMPTE standards-based IP solutions in the company's modular InfinityLink and DigiLink media transport platforms.